We were camping at Gloucester, NSW, last Christmas and it got quite warm in the camper during the day, even though it was parked under the shade of the trees where it should have been nice and cool. 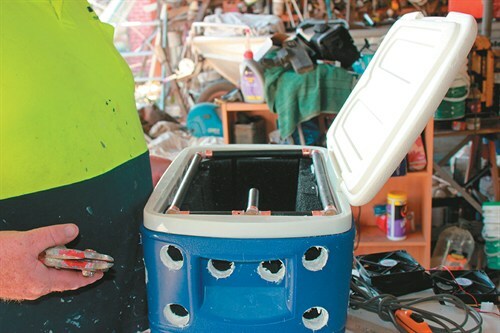 My daughter and I were discussing the evaporative cooler we’d fixed in our investment property over a few beverages and got to thinking… can we make something similar for our camper using an Esky? So we thought a bit more and started to look for the bits we would need to make one. 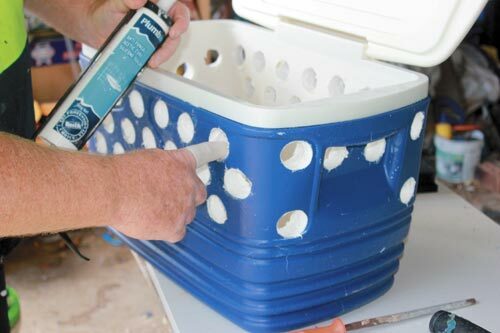 First we needed an Esky, then a small pond pump to siphon the water to the top, some foam or filters to let the water run through and allow air to circulate and some fans to blow out the cool air. So the daughter got onto eBay and found the 12V pond pump, filter pads and some 120mm 12V computer fans. We already had a tee and plumbers hose. A garden hose with 90° fittings also works well. An old cord from a 12V shower provided us with a switch and a standard 12V cigarette lighter provided a connection. We found the Esky at the Reject shop. It all cost $85. Mark out and drill the holes for the air vents ensuring they are evenly spaced on all four sides. 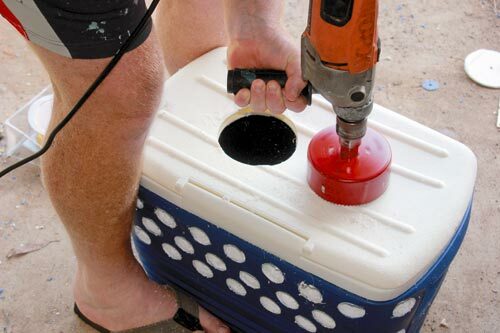 You can use a hole saw or a blade bit. 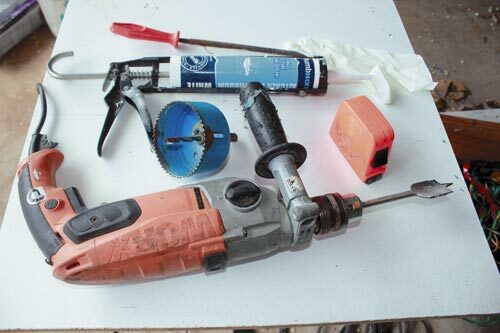 Drill slowly in case the bit grips into the plastic, and clean the holes with a file to take away any sharp edges. 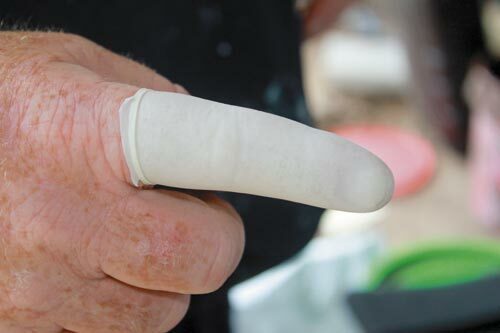 Fit a finger from your gloves so you can seal the circumference of the holes with silicon. Good bathroom silicon will prevent mildew. Apply the filter pads using silicon. 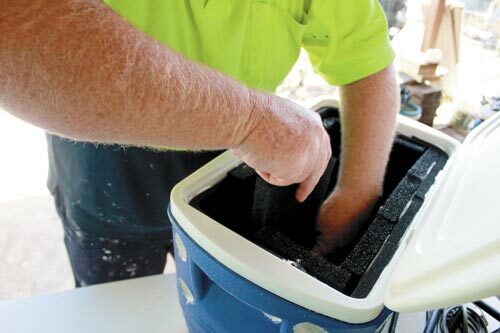 We recommend using two filter pads: a fine grade for the first layer and a coarse one for the second layer. You want the filter insert to be 40mm thick. Make sure you don’t silicon over the holes. The next step is to make the drip pipe. 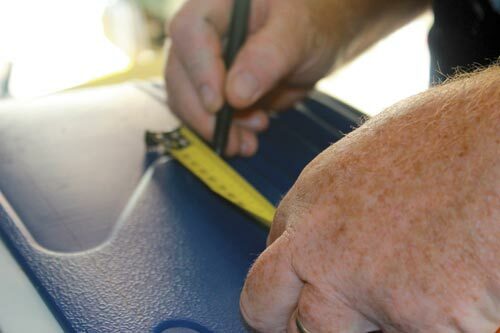 Measure the pipe to sit on top of the inside pad (as shown) so the water does not drip down the sides but through the pads. We used plastic plumbing pipe as I use this for work, but a garden hose and 90° bends will work fine as the set-up is not under pressure. 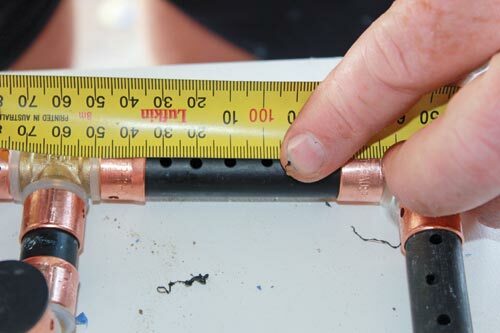 Measure and drill small holes about 10mm apart all around the pipe so that water drips down over the filter pads close to the pad joins. Remember thae hose goes down to the pump so you need a tee as well. Drill holes for the fans. Be careful the hole saw does naot grip. It is best to drill in reverse. 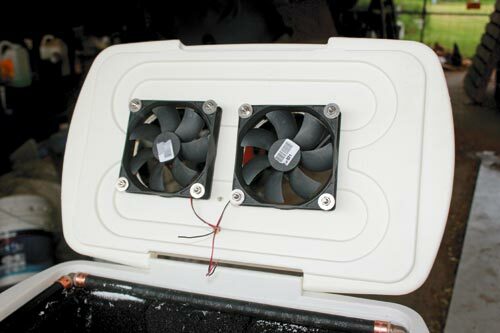 Fit the fans through each hole from underneath the lid. 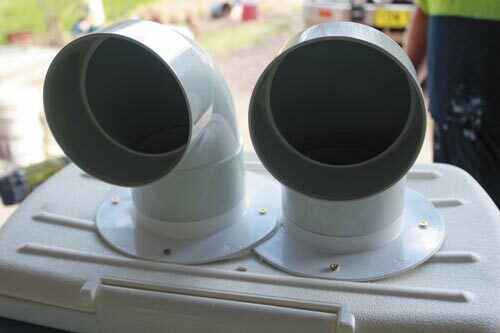 Use plumbing fittings to direct the air in any direction. Now all that’s needed is to wire the fans and pump to the 12V cord and heat shrink the joints. 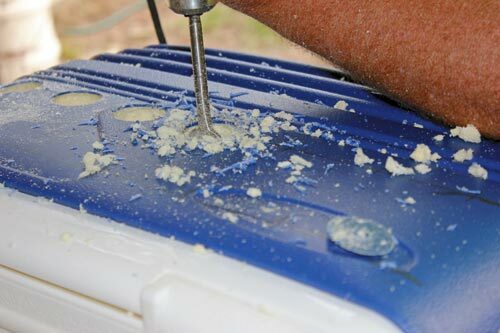 Also, use silicon to ensure the hole for the leads is airtight, so the air comes through the pads. To operate simply add the water and turn it on. Ice will cool the air. Originally published in Camper Trailer Australia #64, April 2013.